The 25-year-old could make his debut against the Dragons. Lowe at Leinster HQ this week. 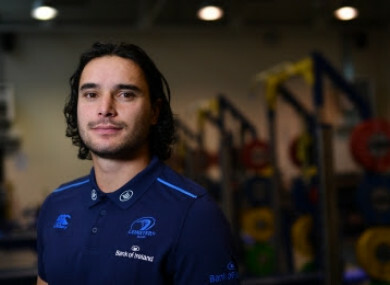 JAMES LOWE, LEINSTER’S new Kiwi back, has arrived in Dublin and is in line to make his debut for the province when the Guinness Pro14 resumes on Friday week. The 25-year-old, who has represented the New Zealand Maori, has this week linked up with the Leinster squad at their UCD headquarters ahead of the visit of the Dragons on 23 November. Lowe signed a three-year deal with the eastern province back in March but had been tied down to commitments with Tasman in the Mitre 10 Cup until the end of last month. The wing/fullback enjoyed a sensational season with the Chiefs in Super Rugby and Leinster fans will need no introduction to his talents having emerged as one of the most exciting young wingers in New Zealand over the last few seasons. His signing is a real coup for Leinster, and his arrival — which will add more firepower to an already potent backline — is a timely one ahead of another big block of fixtures for Leo Cullen’s side. “It’s been great so far, the weather has been good so it’s been a good time,” Lowe said upon his arrival. “Everyone is very helpful here so it’s made the transition a lot easier. Lowe could make his first appearance in blue when the Dragons visit the RDS next week before Leinster resume their Champions Cup campaign with back-to-back games against Exeter Chiefs in December. “I was talking to a couple of the boys before and it’s very exciting to come over here, it’s a whole new challenge for me and it’s something I’ve never experienced before so I’m keen to learn and hopefully help where I can. I’m just excited more than anything,” he added. “I’m excited to challenge myself in a new environment, I’m excited to explore a new part of the world. New Zealand is very sheltered, although we did do a fair bit of travelling for Super Rugby. Over here, like my first few days, it’s very professional and very well resourced. Email “'I'm excited to challenge myself in a new environment': Kiwi Lowe arrives at Leinster ”. Feedback on “'I'm excited to challenge myself in a new environment': Kiwi Lowe arrives at Leinster ”.